I read this book in 4th grade as an assignment and I loved it. This was about a 5th grade boy named August Pullman who had facial disorders he has 26 surgeries but he still dosent look like the others. Will he make it through 5th grade? Read to find out what happens to August Pullman. I really recommend this book to everyone. It is a really good book and it is very sad at some parts so have your tissues ready. It is a really funny book and it will make you laugh!!! Wonder is a book about a 10-year old boy name August (Auggie) Pullman. He has a deformity and a cleft palate. He was previously homeschooled by his mother but he started grade 5 at Beecher Prep School with normal children. He meets a girl named Summer and a boy named Jack and he befriends them. He is bullied a lot because of his face and the only people who see him normally is his dog Daisy, his sister Olivia, and his parents. Whenever people see Auggie’s face they scream and run away or leave him mean notes. Then one day everything changes. People treat him differently and he becomes a popular kid of his school. There are different stories about Via, Justin, Jack, and Summer and then it goes back to August’s story. His life changes, when he goes to school. I recommend this book for all ages. It is a great book that will keep you entairtained. I rate it 5 stars. Have you ever wondered what it would be like to move from being home-schooled to going to school and not looking like a normal child. August has gone through many surgeries and he survived all of them. This book is filled with suspension and cliffhangers between chapters. In conclusion, this book is so good that you won’t be able to put the book down. The main character is August, he was born with a face deformity. His eyes are where his cheeks are supposed to be, and his cheeks are imprinted into his face. August is given a big decision when his mom asks if he wants to go to school. Could you imagine if you went to the store and poeple stare at you and make a face like their discussed? I feel Really bad for August because people call him nasty names ALL the time. On halloween, August is wearing a mask and the boys dont know its him, August hears somethings he does not want to hear. 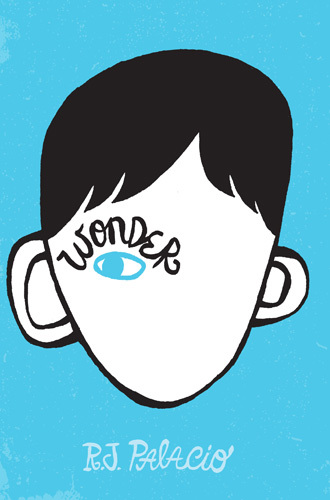 The book wonder is written by R.J Palacio . the book is realistic fiction. wonder is an awesome book. This kid named August he has a disfigured face. And his mom and dad make him go to school but he doesn’t want to. On his first day he makes two friends. August likes school and doesn’t care about what people think. My favorite part of the book is when Jack Will , punched a kid for making fun of August . I think wonder is a great book i recommend this book to any one who likes comedy and sad books. This book is about a kid who was born with birth defects and is deformed. The boys name is August. After being homeschooled for his whole life he decided he’s ready to go to school and at school he meets a friend. You will have to read the book to find out the rest of the book.